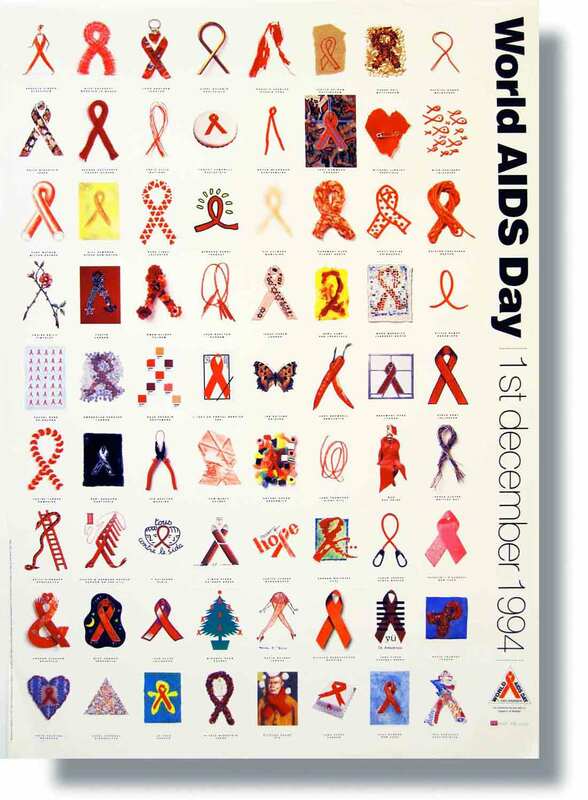 This iconic poster, now in the V&A archive, was designed for The National AIDS Trust to help them publicise the very first World AIDS Day event in the UK. A key issue was raising awareness of the then little known Red Ribbon as a symbol of the fight against AIDS. Our solution was simple but effective: to invite people from all walks of life to show solidarity by producing their own version of the Red Ribbon. We were inundated by the response. These ribbons formed the basis of the entire campaign, which included posters, T-shirts, and information packs. These packs were a valuable resource - a toolkit to give best practice examples and advice to people promoting their own events for World AIDS Day. We then extended the campaign by asking celebrities to produce their own version of the Red Ribbon. These were exhibited and auctioned for charity at an event that gained widespread media attention and acted to further publisize the whole campaign and get the message across. Through a series of award winning campaigns the National AIDS Trust received international recognition of its work from the United Nations. Ideology utilised images of the Red Ribbon symbol with creativity and imagination. This innovative and inspiring work influenced take up and in some cases imitation across the UK. It should be noted that this was ground breaking work. Nothing like this had been seen before in the battle to raise awareness of HIV and AIDS in the UK. It impacted internationally too. Today, it's legacy can still be seen in the UK and global HIV programme.